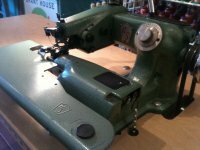 We service nearly all makes and models of home and industrial sewing machines including Bernina, Babylock, Brother, Juki, Elna, Pfaff, Janome - New Home, Singer, Viking, New Home, Janome, Singer, Morse, Kenmore, Highlead, Mitsubishi, Kansai Special, Union Special, Wilcox & Gibbs - Pegasus, Yamato, Bonis, US Blindstitch, Sunstar, Chandler, Tacsew, Liebersew, and pretty much every sewing machine ever made. Cutting machines, professional irons and other sewing related equipment as well. 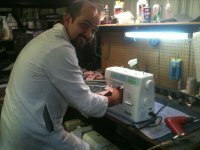 Home sewing machines, sergers, and embroidery machines that are dropped off at the sales and service center for repair or maintenance are serviced bi-weekly on Tuesday. We call this day Service Day. The Service Department is open for drop-off and pick up every Monday thru Friday 10-5:30 and Saturday 10-3. Emergency services are available on request 805 570-9721. Machines brought in by Service Day morning at 10am will be serviced that day and ready for pick up the next business day unless we are not able to reach you for authorization for more extensive work or if parts need to be ordered to complete the work. Coming from out of town? Why not make a day of it? Arrange to bring your machine in for repair before we open on Service Day. Shop, dine, or visit one of the many exciting destinations in the Santa Barbara area. Then come back to pick up your machine later the same day!!! Grant House Sewing Machines can update your advanced sewing equipment for peak performance. For example, we can make your early 800 series Bernina sew better than it did right out of the box! We carry an extensive selection of parts and we have all the special tools required to take your sewing machine, serger, or embroidery machine to its highest level of sewability. Services are provided on an ongoing basis. To ensure satisfaction and for the quickest response, please bring the head of your machine along with any special thread or fabric that represents the kind of problem you have been having. If your piece of equipment is an automatic machine fully integrated with the powerstand, please give us a call in advance. Please call 805 570-9721 to arrange for on-site repairs and emergency service. Available with advance scheduling. It is almost always quicker and a little cheaper if you bring your machine into the Sales and Service Center for service. Regular on-site maintenance schedules are available for industrial users and educational institutions, manufacturing facilities, hotels, and schools.